CANDLES FLICKERED IN THE DARKNESS as Thomas Cranmer, seated before a plain wooden desk, tried to make sense of his life. It was the night of March 20, 1556. He sat alone and confused in an Oxford jail cell, weary from months of trial, interrogation, and imprisonment. Before him on the desk were strewn a number of official documents. There were 14 copies of his fifth recantation, in which he had repudiated the heresies of Martin Luther. The Spanish friars had asked him to sign them before morning so they would have sufficient copies for the printers. Though Cranmer had refused to do so the previous night—he had signed one, wasn’t that enough?—now he debated whether to put his name to them. Next to these lay the speech he was to give the next morning, a speech that repudiated his writings that had denied Catholic teaching. Cranmer agonized. Which speech should he read on the morrow? Which speech represented what he really believed? His critics—and there were many—had accused him for years of hypocrisy; he was a cowardly archbishop who flip-flopped at crucial moments to curry favor with his king. That wasn’t the way Cranmer saw it, but he had to admit it would be hard to interpret the last few months in any other way. At 5:00 a.m., the exhausted, solitary prisoner, weary of internal debate, brought himself to sign the 14 copies of his recantation. He noted it was four hours before he was to be escorted to the stake and burned alive. Cranmer was born 66 years earlier in simpler times, on July 2, 1489. Aslacton, Nottinghamshire, far from the intrigue of court life, was his home, and his father, Thomas, belonged to the lowest rank of gentry. He had only enough property to endow his eldest son, so Thomas and his younger brother were destined for church work. Later in life, Cranmer would blame his “marvelous severe and cruel schoolmaster” for his lack of ability in studies; still, Cranmer attended Cambridge in 1503 and in 1510 became a fellow of Jesus College. When he fell in love and married a relative of the landlady of the local Dolphin Inn, he lost his fellowship (which was given only to celibates). But his wife, Joan, died in childbirth within a year of their wedding, and Jesus College restored Cranmer to his fellowship. He now became ordained as a priest and threw himself into his studies, becoming an outstanding theologian, a man of immense, though not original, learning. In about 1520, he joined some scholars who met regularly to discuss Luther’s theological revolt on the Continent. In the group, dubbed “Little Germany,” were many who would play key roles in the coming decades of the English Reformation, including William Tyndale, Robert Barnes, and of course, Cranmer, who already by 1525 had included in his prayers one for the abolition of papal power in England. Cranmer’s leanings toward reform would have remained merely academic had he not been drawn into the politics of the day. In August 1529, King Henry VIII happened to be in a neighborhood Cranmer was visiting, and Cranmer ended up conversing with two of the king’s councilors. For two years, Henry had been scheming: how could he be freed from his first wife, Catherine of Aragon, in order to marry Anne Boleyn? Cranmer told the councilors he believed that the king had the right to divorce Catherine and that the king should seek out English theologians who could firmly establish his case. Henry summoned Cranmer for an interview and commanded him to write a treatise backing the king’s right to divorce and defending it with arguments from Scripture, the church fathers, and church councils. Cranmer took up residence at Durham Palace, the home of Anne Boleyn’s father, and finished the treatise. But before he could defend it publicly, he was appointed to an embassy dispatched to Rome to lobby for the divorce (of which nothing came), and then to Germany to contact the Lutheran princes. There he met Lutheran reformer Andreas Osiander—and Osiander’s niece, Margaret. Osiander’s theology and his niece so appealed to Cranmer that, despite his priest’s orders, he married her in 1532. He had moved decidedly in the direction of the Reformation, but he was not yet ready to make his marriage, or his theology, public. For Cranmer, 1532 proved to be a critical year in another respect. In August, the aged archbishop of Canterbury died. With the divorce question coming to a head, the see would have to be filled quickly. With his priorities set, Cranmer proceeded to do what was expected of him. In May he convened his court and declared the king’s marriage to Catherine of Aragon void from the beginning; he then pronounced the marriage to Anne Boleyn (which had secretly taken place in January) valid. This would be the first of many Cranmer decisions that make him seem servile. But Cranmer believed in royal absolutism, that his primary duty was to obey the king, God’s chosen to lead his nation and church. Cranmer was prepared to sacrifice nearly all other doctrines to this one. If the king were to order him to sin, Cranmer would draw the line. Time and again in Henry’s rocky reign, Cranmer was ordered to support religious policies of which he disapproved, and he had to decide whether to resist or obey. Under Henry, he always obeyed. In 1536, he became convinced by rather dubious evidence that Anne had committed adultery, and he invalidated the marriage. In 1540, he ruled that Henry’s proposed marriage to Anne of Cleves was lawful—and when Henry sought a divorce six months later, Cranmer approved it on the grounds that the original marriage was unlawful! In these matters, he did as he was told, though it seems he convinced himself in each case that he was doing the right thing. Many times it may have been justified as the right thing to do because Henry wanted it, and Henry was God’s voice for Cranmer and the nation. But Cranmer wasn’t a lackey. Time and again, Cranmer alone of all Henry’s advisers pleaded for the lives of people who fell out of royal favor. With equal courage, and futility, he pleaded for Sir Thomas More and John Fisher (Catholics who refused to acknowledge Henry as supreme head of the English church), Anne Boleyn (when the king wanted her beheaded), and even Thomas Cromwell. Cromwell was Henry’s point man in ecclesiastical affairs. With his help, by 1536, the Church of England’s ties with Rome were completely severed, and Henry had been proclaimed supreme head of the English church. Cromwell had pushed for the distribution of an English Bible in every parish church. With Cranmer, he had helped bring about the Ten Articles (and its commentary, the Bishop’s Book), which moved the nation in a Protestant direction. But Cromwell’s plans soured in 1540. He had negotiated Henry’s marriage to Anne of Cleves to secure closer ties to German Lutherans. But Henry found Anne disgusting, and with the divorce, Cromwell’s enemies convinced Henry that Cromwell should be destroyed. It was a courageous letter. Cranmer was in danger of being thrown in the Tower himself for declaring himself in this way. Nonetheless, Cromwell was condemned without a trial and beheaded. By this time, Cranmer had become clearly Protestant in his views. Like Henry, at first, he tried to keep as much of Catholicism as he could, including the doctrine of transubstantiation (which states that Christ is substantially present in the Eucharist even though the bread and wine remain unchanged). By 1538, he had abandoned this view, but already two years earlier, he had developed a Protestant reputation: northern religious rebels believed he was the leader of Henry’s Protestant faction. As Cranmer moved toward a clear Protestant position, Henry began retreating to a Catholic position on many matters. In 1539, Henry proposed that Parliament pass six articles that would, among other things, insist on clergy celibacy and transubstantiation. Rather than confining his criticisms, as he usually did, to private conversations with the king, Cranmer openly opposed the king’s proposed policy, arguing boldly against the Six Articles in the House of Lords. It required no small courage to argue doctrines that were about to become heretical and punishable by death. But as soon as the Six Articles were passed, Cranmer capitulated completely. How he could justify this as obedience to his sovereign is hard to explain. Cranmer had rejected the doctrines in the articles for at least a year, but as Henry’s archbishop, he not only acquiesced after their approval, he enforced them—even when it meant arresting priests who had wives. This seemed especially culpable, considering Cranmer had himself kept a wife, who was now hidden in Germany. To most Protestants, Cranmer had compromised the Reformation. Still, it wasn’t as simple as that, because a few years later, Cranmer smartly criticized the king’s theology and grammar in the debates over the 1543 King’s Book (which further defended many Catholic doctrines). 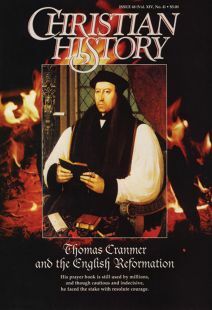 Cranmer must have retained sufficient Protestant vigor because in Henry’s last years, Cranmer’s enemies laid at least three plots to destroy him. But each time, they were foiled by Henry. The last attempt was most curious. Cranmer’s enemies in the Privy Council (Henry’s cabinet), convinced Henry to allow them to arrest Cranmer for treason and commit him to the Tower. Why Henry agreed is hard to say because late at night the day before the planned arrest, he called Cranmer into his room. He gave Cranmer his ring, which signaled his approval, and told Cranmer to produce it when he was examined by the council. The next day at the council, when Cranmer was told he was to be committed to the Tower, he produced the king’s ring. The council was thrown into confusion and immediately went to Henry and apologized profusely. This king, who usually kept himself above personal feelings for his advisers, found in Cranmer a man he trusted and liked. So it was Cranmer whom Henry asked for on his deathbed, and it was Cranmer’s hand that he held when he died. With the accession of Edward VI in 1547, Cranmer’s time arrived. The young king’s guardian, Edward Seymour, Duke of Somerset, immediately began to transform the Church of England into a decidedly Protestant church. When he fell from power in 1549, John Dudley (later known as the Duke of Northumberland), who had ousted Seymour, moved in an even more extreme Reformed direction. During this era, Cranmer took the chief role in directing doctrinal matters. In 1547, he published his Book of Homilies, which required clergy to preach sermons emphasizing Reformed doctrine. He composed the first Book of Common Prayer, only moderately Protestant, in 1549, followed in 1552 by a second that was more clearly Protestant. During these heady years, Cranmer also produced the Forty-two Articles (1553), a set of doctrinal statements that moved the Church of England even more toward a Reformed, Calvinist direction. Clergy, teachers, and university degree candidates were compelled to assent. Though deprived of any serious influence in affairs of state, Cranmer dominated this religious revolution by his learning, authority, and hard work. As Edward VI approached death in July 1553, Cranmer became fatally involved in royal politics. Though he resisted for a long time, he was forced by the dying king and Northumberland to support Protestant Lady Jane Grey (great-niece of Henry VIII) as the new sovereign—even though this struck at custom, statute law, and the will of Henry VIII. Upon Edward’s death, Lady Jane Grey was proclaimed queen but was deposed nine days later, and Mary (Henry’s daughter by Catherine of Aragon and a devout Catholic) triumphantly entered London. With Mary’s accession, the English Reformation began to unravel. Cranmer’s embittered enemy Stephen Gardiner was promoted to the chancellorship, and Cardinal Reginald Pole became archbishop of Canterbury. Parliament repealed the acts of Henry VIII and Edward VI and reintroduced heresy laws. Mary’s government began a relentless campaign against Protestants. Cranmer in the meantime had been charged with treason and imprisoned in November 1553. His trial, though, was a pretext; the queen and her advisers wanted to destroy him and his credibility completely for his long-standing Protestantism. With Reformers Nicholas Ridley and Hugh Latimer, Cranmer was moved in March 1554 to Oxford to stand trial. In September 1555, after an enfeebling imprisonment, Cranmer was subjected to a long, tedious trial at which he tried to defend his views. Whether from discouragement or isolation or mental torture, Cranmer was often bested in debate. “It was so,” replied Cranmer. The foregone verdict was reached after many technical hurdles, and in February 1556, in a ceremony carefully designed to humiliate, Cranmer was degraded from his episcopal and priestly offices. He was forced to wear canvas and cotton garments, mimicking the rich and costly vestments he had worn as archbishop. The pallium, the symbol of his archbishopric, was stripped from his back. The chalice, which had been placed in his hands, was pulled away. The Gospels and Epistles were taken from him; his priestly tunic and stole were stripped from his body. A barber shaved his head, and the tops of his fingers, where he had been anointed, were scraped clean. Yet Mary’s government wanted more. The burning of the archheretic would be even more useful if he would renounce his errors in public, and so a number of means were used to break Cranmer down. The previous October, he had been forced to witness the burning of Latimer and Ridley, and Ridley’s death had been excruciatingly slow. Now he was temporarily removed from prison and placed in pleasant surroundings while government agents tried to stir up his doubts. Spanish friars were called in to apply pressure. “I, Thomas Cranmer, anathematize every heresy of Luther and Zwingli ... I confess and believe in one, holy, catholic visible church ... I recognize as its supreme head upon earth the Bishop of Rome ... Pope and vicar of Christ, to whom all the faithful are bound subject ... “ He went on to affirm the seven sacraments, including transubstantiation. He concluded, “I beg and pray God to deign of his goodness to forgive me the faults I have committed against him and his church.” His humiliation was complete. Still, Queen Mary and Cardinal Pole believed Cranmer must be punished for all the havoc he had wreaked. He would be burned at the stake after making one more profession of his faith. The morning of March 21, 1556, broke with dark skies and fierce rain. At 9:00 a.m. Cranmer was escorted from his cell. As he left, he said to his jailer that if anyone doubted his recantation was sincere, his signed recantation would leave no doubt, and he handed the 14 copies to his jailer. But hidden in his shirt were both the Catholic and Protestant versions of his final speech. The rain meant the formalities that were to precede the burning had to be moved indoors to St. Mary’s Church. The procession chanted psalms as it slowly moved through the rain to St. Mary’s. At the church, Cranmer was led to a stage facing the pulpit. There, clothed in a square cap and ragged, thread-bare clothes, he was required to stand and listen to Henry Cole, provost of Eton at Oxford, preach. Cranmer knelt with the congregation in prayer; then he rose and put off his cap. He drew out a piece of paper and began to read. He thanked the people for their prayers and exhorted them in four points: to care less for this world and more for the next, to obey their sovereigns out of the fear of God, to do good to all people, and to be concerned for the poor. Cole shouted out, ordering Cranmer taken away. Cranmer was dragged from the stage. But it was Cranmer as much as the friars who rushed to the stake because they had a hard time keeping up with him. When they reached the stake, the friars threatened him and warned him to repent, but Cranmer knelt on the bare ground and prayed. Then he rose, put off his outer garments, and finally stood in a long shirt that touched his bare feet, his long, white beard reaching to his chest. He clasped the hands of friends who stood nearby and bade them farewell. He was bound to the stake with a steel band around his waist. The fire was kindled at his feet, and quickly the flame leapt up. Cranmer stretched out his right arm and hand into the flame and held it there as he said, “This hand hath offended.” Only once did he withdraw it to wipe his face, and then he returned it until it had burned to a stump. He stood straight as long as he could, ringed in fire, saying, “Lord Jesus, receive my spirit!” He then collapsed and was consumed in flame. Rain continued to fall softly, and gently cleansed his ashes. Mark Galli is managing editor of Christian History. One woman’s extraordinary faith reveals much about the ordinary faith of the Middle Ages. Angry colonists were rallied to declare independence and take up arms because of what they heard from the pulpit. What exactly happened at the famous Council of Nicea, when the Roman emperor convened some 250 quarreling Christian bishops? Whether he was battling despair or floating on euphoric faith, Hudson Taylor drove himself—and the gospel—ever deeper into China.